The modern business and brand need to advertise in a variety of media, depending on the situation and audience they are trying to reach. One great way to increase local or site-related impact is to use Pull Up Banners from Not Just a Copy Shop. Pull Up Banners are a cost effective promotional tool for small business and a great way to increase awareness of your brand, product or service at any event. 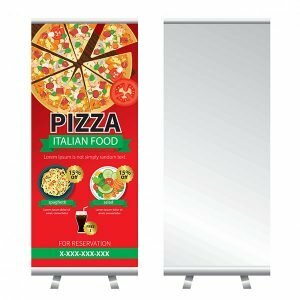 Pull up banners are versatile and can be used at trade shows and exhibitions, product and corporate launches, sporting events, customer functions, dinners, conferences, school events – basically anywhere you have a few square feet of floor space. You can display them absolutely anywhere to quickly grab the attention of passers-by.